Pompey, New York Real Estate - http://www.CNYAgent.com - Contact Bob McTague at 315-882-6610 – 2841 Sweet Road, New York - Welcome Home! 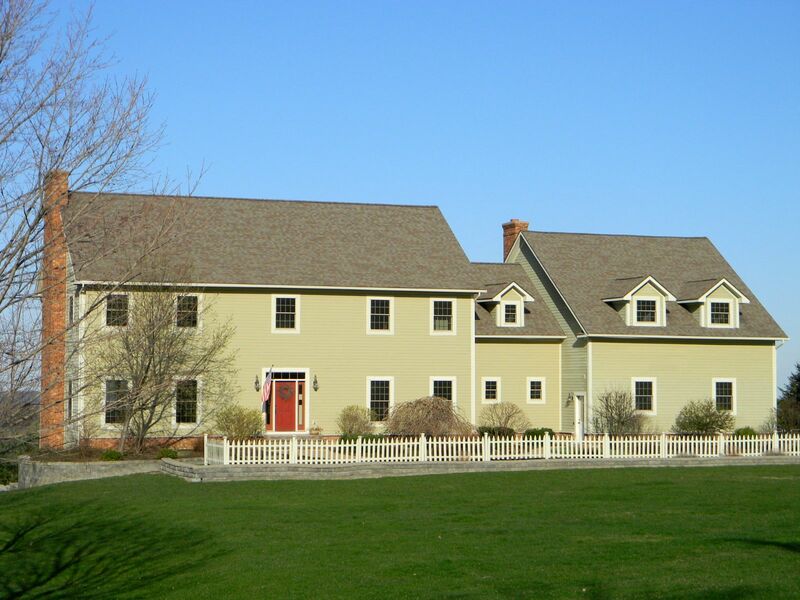 Country sophistication in this custom built New England style colonial perfectly situated on a 3 acre lot in Pompey with magnificent views. From the exceptional curb appeal to the stylish and spacious floor plan with 5,275 of living space, this beautiful home offers quality features and charm throughout. Relax in the cozy and inviting family room, which offers a wood burning fireplace with plenty of windows for sun light. Entertain in the formal dining room. Gather in the 32'x15' Custom Collective kitchen by David T Smith with soapstone countertops and sink, 5'x4' Island, 6000 series Sub-zero refrigerator/freezer, 6 burner Wolf commercial stainless steel stove, Wolf built-in convection oven, Lasko commercial dishwasher, and a large eating area complete with full wall fireplace and an access door to the large deck. The added bonus room just off the kitchen is a walk in pantry with second refrigerator and utility sink. The first floor also offers 9’ ceilings, a sitting area, and two half baths with custom handcrafted vanities. Slip away into the light filled sun room that provides secondary access to the 16' x 70' trek deck. The second floor features 8' ceilings, 4 bedrooms, master suite with fireplace, full bath with 2 person whirlpool tub, large jetted shower with two showerheads, 9'x16' California style walk-in closet w/ironing center, computer room, laundry room w/ ironing center, 40'x30' bonus game room with several built in storage units and second full bathroom w/two sinks. Beautiful 10" Southern Yellow Pine plank floors fill the first and second floor space expect for the bonus room which offers carpet and the bathroom(s) which provide ceramic tile floors. The lower walkout basement level provides 9' ceilings, 2272 sq. ft. In-law apartment, full kitchen w/breakfast bar, full shower unit, family room with flue for gas fireplace, large bedroom w/area for walk-in closet, laundry hook-up, four season sunroom with sliding door to future patio. Some of the special quality features include radiant 6 zone floor heat, central A/C, two completely separate units (5 ton unit for the first and lower level, 3 ton unit for second floor. ), tankless water unit offering an endless supply of hot water, house generator that will provide power for 30 days, Gould commercial water system, Kinetico water softener system, Pella architectural series oversized cottage windows and doors, 6" construction on all exterior walls, poured concrete basement wall 10" thick, R-30 exterior foam sprayed walls, R-50 ceilings, insulated commercial garage doors w/openers, copper roof on bay window, All roof flashing is copper not aluminum, circuit breaker panel on second floor for second floor, all appliances & heating and cooling are energy star. This property is Zoned residential/agricultural ( horses allowed) and located in a quiet country setting close to shopping, resturants, sports (Syracuse 22 min. away), golfing (a golf car ride away), swimming, boating, hiking, hunting, and skiing is minutes away. Call today to set up a private showing!